It's the first day of another month again! How time flies. As usual, the 1st of the month is the City Daily Photo Theme Day. The theme this month is "Contrast". See what projector lights with 3000 lux of brightness can do. 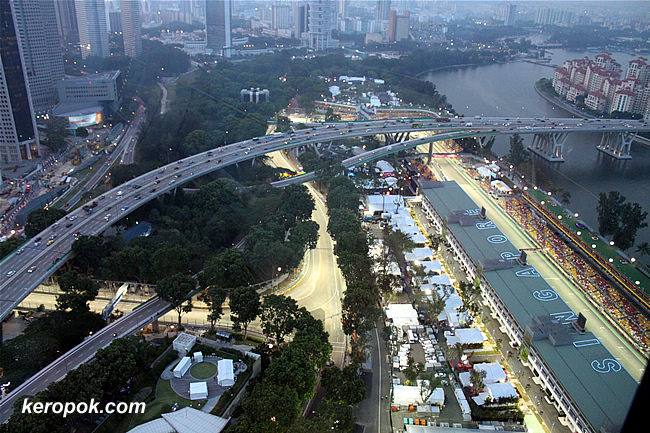 This was the F1 Singapore Grand Prix last weekend. With these powerful lights, night was turn to day! Look at the 'roads' or 'tracks' that was transformed. Want to know how other City Daily Photo bloggers are interpreting the theme? Click here to view thumbnails for all participants of October's Theme Day. good way of doing the theme - I watched the race on Sunday afternoon here. Very cool - those lights must be awfully bright!!! A stunning photograph. Just beautiful! Grreat to see a photo of Singapore like this. I watched the race and the pre-race and saw fabulous views and you've captured it SO beautifully. Great Theme Day choice from a beautiful city. I think of the S'pore I lived in between 1963 and 1966... what a contrast there too! This is glitzing modern Singapore at its most impressive. Love the pic and nice contrast theme. Dutch homesteads r surrounded by water. We love boatings in the summer n ice skating in the winter. Most of my dutch friends thought it odd that Sg'rean kids r not taught to swim (as a compulsory subject in school)when they live on an island ! Well, I do see their point. The kids here gets cycling lessons as well n the communities r involved in keeping the roads safe (with lovely colorful signs)when school begins after the summer ... in case the drivers forgot to watch out for the kids (._o)! It is so beautiful! Very wide screen. My Bangkok Through My Eyes! Really interesting take on the theme. this is an amazing photo. truly a contrast and quite the angle to capture it. nice choice. Where's the shade? On the road! 200km per hour swing upwards for you?